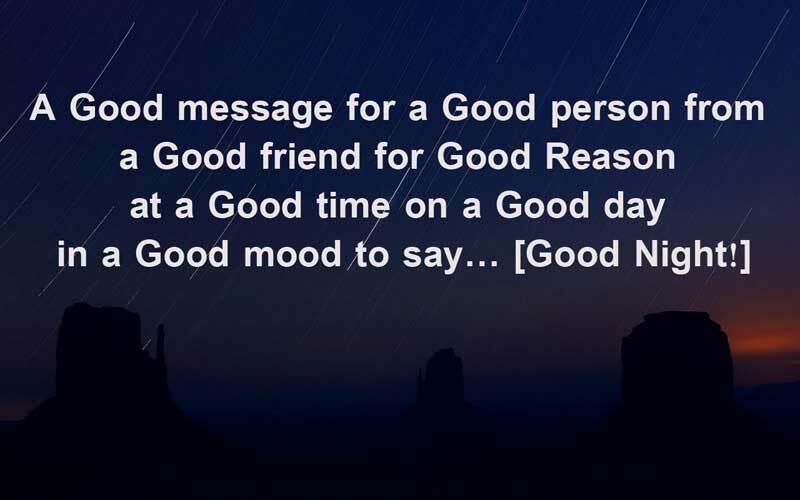 Good Night Messages For Friends : Before you sleep say goodnight to your best friends and send some Good Night Messages For Friends to show them how much you value the friendship. So, you may pray for a healthy and sound physical wellness of your friends at good night message or make some fun to bring more happiness in their life. 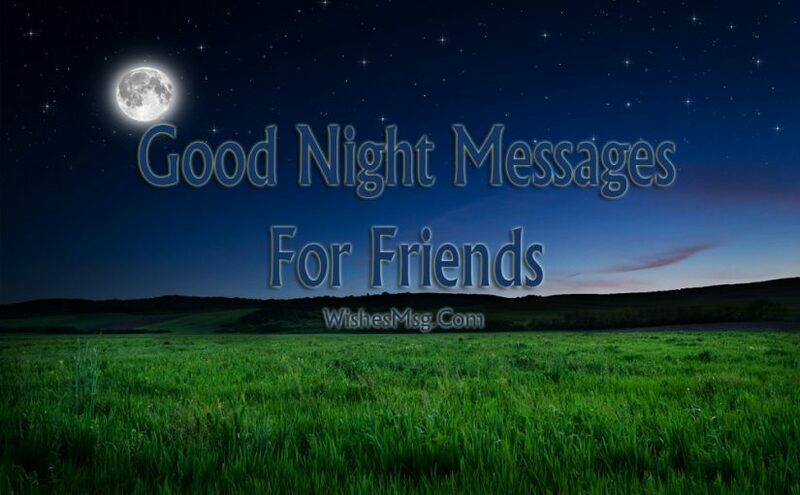 Here are the best goodnight wishes and messages to greet your friends a very special good night and cherish all the crazy things you do together. So don’t miss to wish your bestie good night before they head to bed tonight and let them know that you are praying for them a special dream. Just as the moon lights up the sky when it is dark, you light up my life with your advice when I am going through difficult times. May you rest quiet dear friend, goodnight. As the light goes dim and the world goes silent let your eyes and body take some rest. Make sure to make it sweet and sound. Good Night. In this night I hope that you will stop using mobile and go to sleep after reading my message. Now keep the phone away and sleep well dear. Good night. If you feel lonely in this night, think about the scary faces and ghosts. Can you see them? Good night my friend. Have a nice sleep. I hope there are no bugs in your bed. Last time I found some. I think your bed is clean now. Now sleep, my friend. Good night. Don’t forget to brush your teeth and wash your hand and face before sleeping. You have to meet me tomorrow. So go to the washroom. Good night buddy. If you feel lonely don’t worry. I am here to disturb you all the time. Now sleep well. Good night dear. Have a wonderful scary dream! I used up all my energy in laughing all day! You’re all fantastic! Let’s recharge for we need more energy tomorrow. Good night! Sleep as early as you can so that you can dream about all the pranks we can play in class and all the fun we can have at school tomorrow. Good night. Good dreams come to those who sleep so close your eyes and go to sleep! Your dreams can’t come when you’re wide awake! Shut those peepers and get some sleep! Since the owls have taken over the world to guard, and vampires to look after all of us, take a break from worldly ventures and hit your bed. Have a happy night and sweet dreams. We have always been the best of friends and we have done everything together. So you should dream about your crush tonight and I will dream about mine. Dear best friend, you are the most beautiful minded person I have ever met. I wish you a very charming and peaceful night. Good night dear. In this beautiful night, I am sending a charming message to a charming person. Goodnight dear best friend. Have nice sleep. Enjoy the night and think about your life. You are a special gift from God. I wish you a wonderful night. Have a sound sleep dear. I am lucky that I have found a friend like you. I am sending this message with lots of love. Good night friend. Have a sweet dream. You know God has given us the night to remove our stress, sadness, and tiredness. So utilize the time. Go to sleep and relax. Good night dear. We did not meet by chance but because fate wanted us to. You are the person who understands me and helps me at all times and at difficult moments. Thank you for being my best friend, may you have sweet dreams. Even if I had a bad start with my day, spending it with you magically turns it into a bright day. Good night my best friend! Every night I go to sleep very happy because thanks to you I have very special moments. You have become my best friend and I appreciate it. May you rest so you can recharge your energies. Let’s go to sleep my friend, we are pleased to have given all our efforts during this day, I know that tomorrow is a new opportunity and we will do our best. Sweet dreams. Thank you God for giving me these precious gifts: my friends. Look after them while sleeping because I want to spend another day with them. Good night chums! My friend, you are the light in my dark, the smooth in my roughs. The correct in my wrong, the easy in my toughs. The bright in my dull, the good in my bad. The smile in my frowns, the happy in my sad. Good night. Thank you for everything you did for me today, you are a great person and I value your friendship, have a good night sleep that tomorrow we will have new challenges to face. I know I take you for granted every now and then even though you are my bestie, but being alone every night reminds me of how precious you are to me. I will be someone who’ll help you shave the dark clouds and search for the stars in the darkest of your life. Good night buddy! Sometimes I am goofy, but don’t ever think that I don’t care. No matter what, for you, I will always be there. Good night. Goodnight it is to you my friend you’re the star that God has to send shining brightly on the dark sky leaving me with a warm smile. A day is going to end again. It is nice to have a friend like you. Making my everyday seems so great. Thank you, my friend, lastly. Good Night and Sweet Dreams. I lasted a day without you, but it’s not as happy as those days when I’m with you. I miss you, friends! Hoping to see you tomorrow. Good night! Fluffy pillows and cozy covers, beautiful dreams, and the warmest snuggles. May your dreams are full of wonderful thoughts and lovely things. Stop thinking about all the things people said to hurt your feelings. Just hold on tightly to the memories of all the times someone made you smile. Good night. As the sun sets, lovers, send each other hug and kisses while friends send each other luck and wishes. 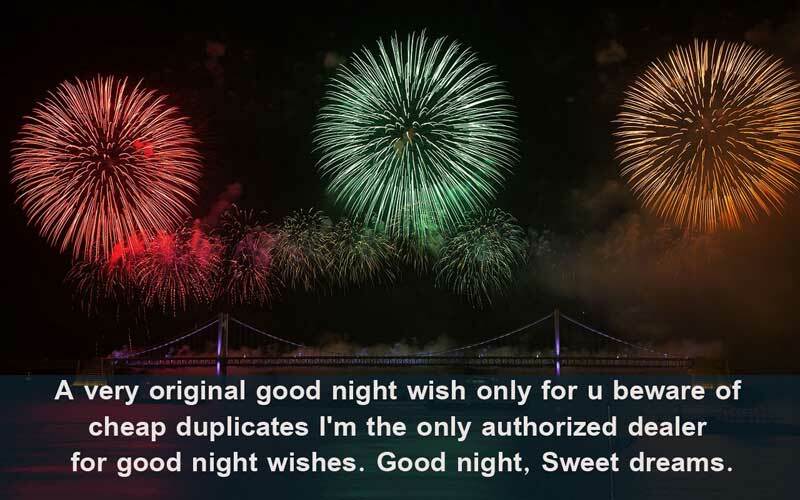 I hope that this night brings you luck which helps you fulfill all the dreams that your dreams. Good night. Real friendship is where quirks are celebrated, eccentricities are applauded and idiosyncrasies are flaunted. Ours is exactly like that. Good night. It will be a pleasure for us if you find these good night messages for friends helpful and surely these messages will inspire you to write your own good night wishes which will be unique from others! Poke your friends with a sweet goodnight message or an inspirational good night quote while you are rolling around in bed. Send good night texts, make Facebook posts, tags on Twitter or shares on Pinterest – do whatever it takes to share smiles, hugs, and kisses with your friends.